Last night I had begun writing for today’s post with every intention of writing about egg-replacer when today after I shared cookies that I made for the post someone made a comment that many Vegans are oh so familiar with… “How can these be vegan? Are you sure, they are so moist?” Ugh, what planet are they from? In this day and age that thought process is as archaic as thinking no animals were harmed in that slab of bacon they are eating or the milk they are drinking! 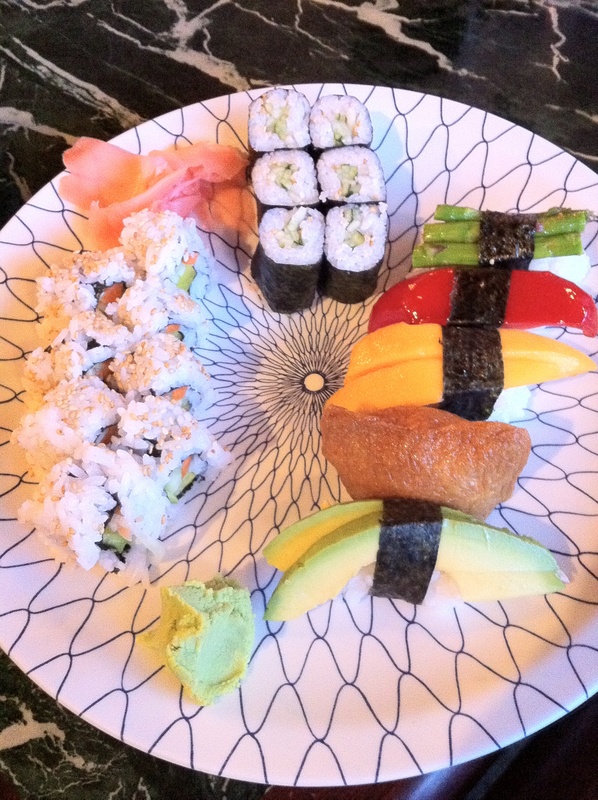 This had me thinking all day, then while we were out at a celebratory dinner for a huge achievement my daughter made in Tai Kwan Do, I looked at our Green Belt vegan sushi plate and remembered long ago how I thought I could give up anything but sushi never realizing it was the wasabi kick I craved more than anything. Later I realizes as a vegan I am able to enjoy the same joys of food as anyone else I simply choose to do it with out the animal products. Actually I find it more enjoyable knowing nothing was harmed in the process. Hopefully, with the help of Vegan MOFO we can help people realize that we aren’t punishing our taste buds by consuming a vegan diet, quite the contrary. There are so many vegan recipes, restaurants and products available to us in this day and age its a wonder that more of the population hasn’t followed our lead. 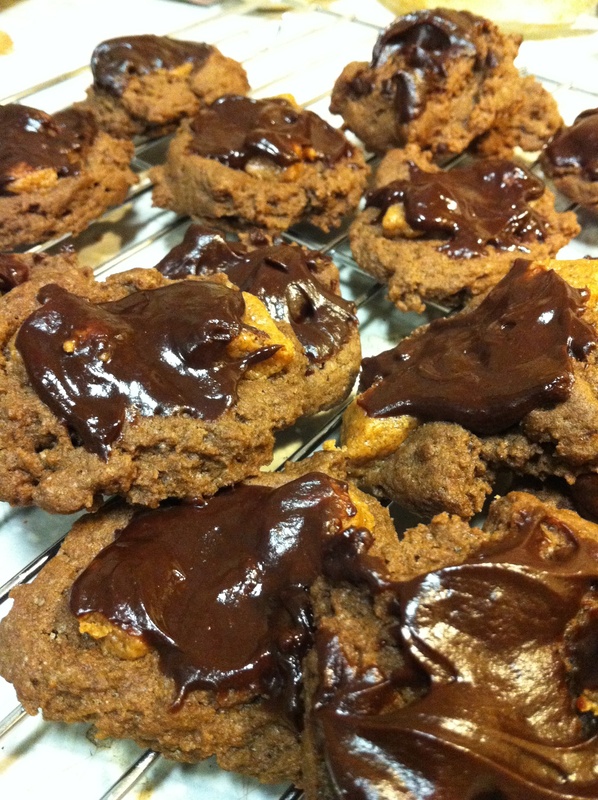 If you ever want to show someone how delicious vegan food can be, make them one of these delicious Chocolate Pudding Cookies with Peanut Butter Chips (recipe below), they will become believers! In a bowl mix flour, baking soda, and salt. In a mixing bowl combine flax meal and water. Add butter,sugars, pudding mix, syrup, cocoa and almond to flax meal and mix until completely mixed. Mix in flour mixture a 1/2 cup at a time until blended completely. On a cookie sheet covered with parchment paper drop cookies a tsp at a time, gently pushing cookies down with back of spoon to flatten slightly. Ok, so I took my peanut butter chips out of the freezer when I started making the batter so they got soft which forced me to lie them on top of each cookie, which I was fine with. I was able to strategically place a couple of chips on each cookie. If you leave them frozen until they are ready to be used you may be able to mix them into batter, though it is pretty thick. Bake for 9-11 minutes. They will be very soft until cooled and being chocolate it was hard to tell if they were done so I sacrificed my tongue by eating one straight out of the oven to make sure the center was cooked. Let cool on cookie sheet for 2 minutes then move to a cooling rack. Let cool for 20 minutes before icing. Makes about 4 dozen. To make icing melt chocolate chips with almond milk in a sauce pan over low heat. Once melted completely stir in peanut butter. My original plan was to use to use a pastry bag and drizzle the chocolate over the cookies all pretty like but reality sunk and I came to terms with the fact that I was not Superwoman. It was midnight and I needed to be up at 5:30 the next morning so I simply flipped the cookies over and dunked them in the chocolate running out of chocolate 1/2 way through. If you opt to use my lazy girl but tasty method you will probably want to double the icing recipe. If you are going to be all crafty and pretty the above measurements are perfect. These cookies are extremely moist and the icing sill stay soft. Oh so tasty and enjoyable! How can I get your recipe for green belt sushi???? I wish I knew how. We go to a restaurant!